A person aspiring to be a student of a prestigious institution like SKAIL must be looking forward to an impressive campus and a state-of-the-art infrastructure. SKAIL is having its own campus on an area of seven acres of land within the campus of University of Kalyani at a prime location, adjacent to the University entrance gate. The foundation stone of the SKAIL campus was laid by Honorable ShriJyotiBasu, former Chief Minister of West Bengal on 30th day of June, 2004. The construction of 1st floor on-wards of SKAIL building (total area – 60,000 Sq.ft.) has been completed in the year 2006, and appears as a marvel of architectonic beauty in consonance with academic needs and pursuits. The day, 24th July 2006 ( Monday ) will go down in the annals of SKAIL as greatly eventful since the much envisaged building of the Institute in its ground floor ( 1st Phase of 3-storied structure ) as completed within a record time of six months , was inaugurated on the day with great joy, fanfare as also serious deliberations in presence of a host of noted academics in diverse fields, chairman, Bar council of West Bengal, some other members of the said council, the Deans of respective Faculties of Kalyani University, some of the Heads of academic and administrative departments of the University, the guardians, students & other invitees. The administrative arena including the earmarked rooms for Director, Visiting Faculty, Registrar and Lecturer-in-charge was opened by Prof. AmitSen, Director of SKAIL and Ex-Member, W.B Human Rights Commission. The Library block was opened by ShriSanatan Mukherjee, Ex Chairman, Bar Council of West Bengal, who also graced the celebration as Chief guest. All the speakers showered praise on SKAIL for its discipline, vision, academic pursuit and dynamic approach to campus development in faster pace. The chief guest specially mentioned of this new Institute as having very faster growth with a beautiful campus and spacious building with the motto of running an academic Institute in true sense, holding out promise for bright career of the Law students, not to be found in plenty in the state. The well furnished spacious classrooms in the new building has modern audio visual aids and other required facilities inclusive of separate facility for conducting clinical education programme. Library being the heart of an academic institution, SKAIL may take pride of its well equipped, well managed and professionally run library developed within a span of only one and half years. The library has access to internet facility. The Institute also subscribes to a good number of law journals. Apart from having institutional membership with the British Council Library, Kolkata, SKAIL has initiated for same membership with the Indian Law Institute Library, New Delhi. The facilities at Library include reading section, borrowing rights, photocopiers, computer print-out facilities, etc. It is proposed to introduce the system of self-access to the book-shelves to facilitate reference to various books for intensive study and research work. The Library maintains a core collection of Federal and regional reporters, various periodical subscriptions and several online databases. The goal of the Library staff is to provide the best possible service to those individuals using the Library. Special subjects consisting of text books, reference books, back volumes of journals and reports from 1950 to up to date are available in the library. The Library has adopted an open access system so as to facilitate readers to have easy access to the library resourses. The Law Library is equipped with today’s state-of-the-art technology. Wireless access(Wi-Fi) is available to the law School network. Students may access a full array of internet resources and online services. SKAIL library is being run with competent staff inclusive of the duly qualified Asstt. Librarian, Ms. Asmita Das who is available at the library for required guidance. Library remains open from 10:00 a.m. to 5:00 p.m. on all working days. However during examination period the library shall be open from 10:00 am to 7:00 pm. 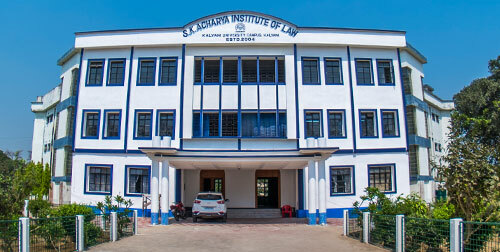 SKAIL has developed a state-of-the-art computer lab with internet and other advanced communication and legal research facilities to facilitate access to latest legal information to students and to facilitate legal research. It is also proposed to subscribe to major electronic law journals. The computer lab was inaugurated by Prof.P.K.Saha, Ex Vice-Chancellor , University of North Bengal on 5th September, 2008. SKAIL has a language lab with advanced audio visual facilities and latest computer softwares. The Lab is designed to improve communication skills of the students, which has an important role in oral advocacy. A distinguished English Teacher has been employed who is taking care of the students who want to develop fluency in English and command over the English language. SKAIL has a well equipped conference room with conferencing and audio visual facilities for organizing conferences, seminars and workshops. SKAIL has a well designed Students’ Court Room for organizing Moot Court programmes. 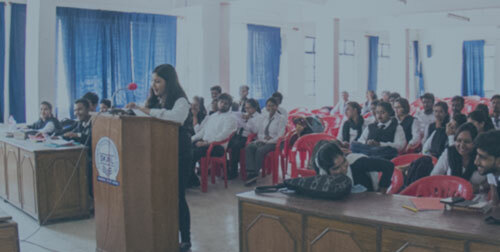 The Students’ Court Room will provide a real court ambience to the students and will help in their orientation to a court room setting and thereby increase their confidence. The Moot Court hall is dedicated in the name of noted Jurist of Nadia, Late Shri. Sankar Das Banerjee. The moot court hall is built within an area of 5000 sqft. On the first floor of the building. SKAIL has a spacious and well planned conference room at its new premises fully equipped with modern conferencing facilities and LCD projectors for organizing seminars, conferences, workshops and symposia. The B.ALL.B(Hons) degree 5-year duration, based on completion of ten semesters, is envisaged as a residential programme. In lieu of exhausting commuting and consequent time constraint on the part of a student, 24-hour stay on campus will ensure a healthy environment conducive to academic pursuit, exposure to knowledge world through access to book & journals at the library and to internet as remaining open till late evening, constant faculty guidance, interaction and prolonged hours for cultivation of extramural activities. 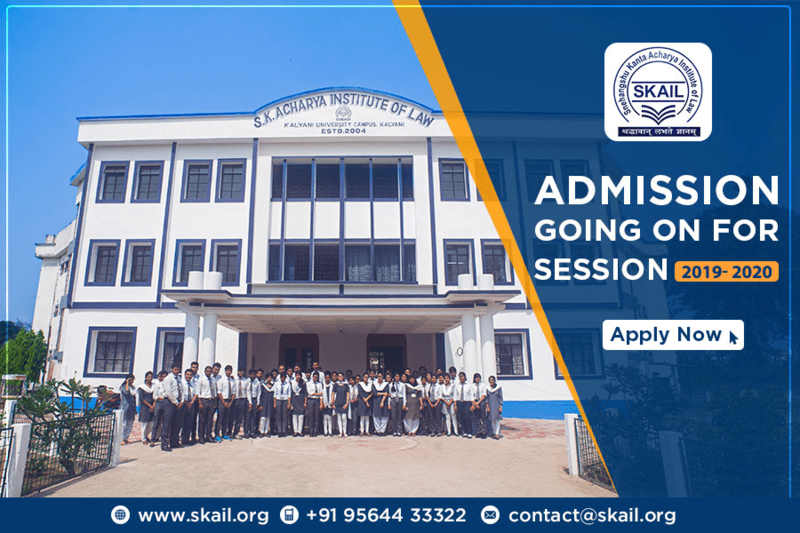 Professional orientation and man making being the hall mark of SKAIL, students are encouraged to stay at the Hostel and prosecute studies, having distinct opportunity to imbibe the objectives of the institute. A vibrant and lively campus would be all the time positive and inspiring. From the session 2007 the Boy’s Hostel named as “ RADHA BINOD PAL BOY’S HOSTEL” has been shifted to the new campus on the upper floor of the SKAIL building for better upkeep and enthusiastic response to a corporate life. For the present, the Girl’s Hostel named as “ SISTER NIBEDITA GIRL’S HOSTEL ” would continue to remain a little of the campus in a congenial atmosphere with all amenities and safety measures. It is a well-equipped hostel in a prime location just behind the Kalyani Police Station on a 10 kata land. The food court, has been built on the new campus, serving wholesome meal and also refreshment at a reasonable cost to all students. Hopefully, this will turn out to be rendezvous especially for the students. The food court is built with an area of 5000 sqft. and the food court arena is deemed for students hangout area to relax and enjoy to release stress of the students as they are in continuous classroom teaching as per strict routine of the teaching schedule everyday.